Uncharted territories, even in a relatively sparsely populated state such as Minnesota, are few and far between. 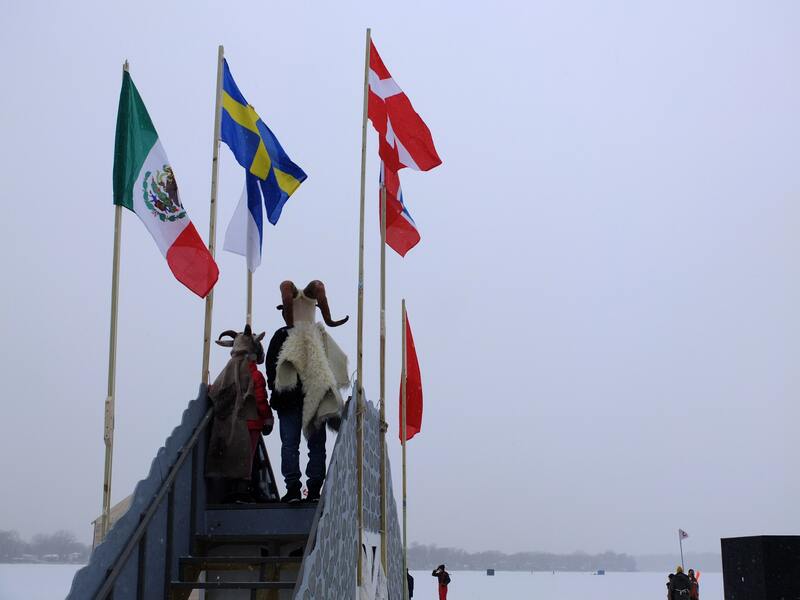 But each January, when the average temperature lingers around 7 degrees Fahrenheit, one such place comes into being, briefly, on the frozen surface of Medicine Lake, just west of Minneapolis. 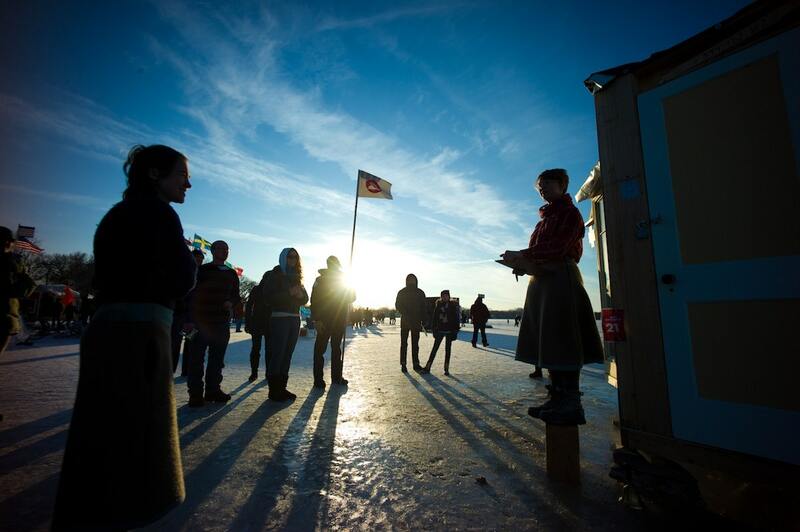 Now in its eighth year, the Art Shanty Projects have turned a swath of ice usually reserved for fisherman and snowmobilers into a temporary autonomous zone where artists open the doors of specially constructed shacks to host everything from dance-offs and karaoke parties to solar music performances and demonstrations of invented cultures. The notion of planting flags, a theme Thompson’s been exploring in his recent art, speaks to the emphasis on “place” in the projects: staking a claim, however briefly, on an otherwise inhospitable slab of winter-hard lake. 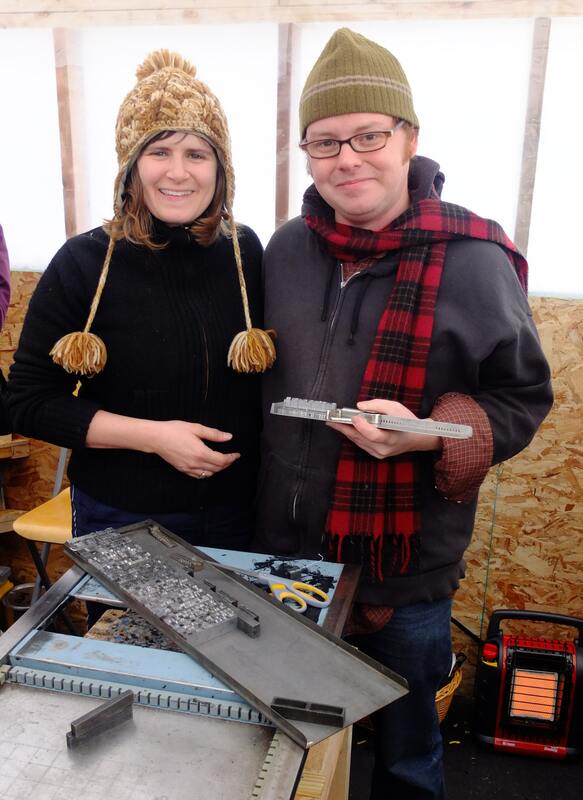 Whether through workshops on making studded bike tires at the ICE-Cycles Shanty or viewing the surrounding area mirrored on the walls of the Reflection Shanty, projects are testaments to place, both in their literal response to the surroundings or in the example of the hardy types who creatively choose to address winter on their own terms. Fresh from teaching a class in the One Room Schooolhouse, Anthony Warnick, outfitted in a seasonally appropriate beard and warming himself beside a woodburning stove, discussed the project one weekend in late January. Generators or electricity aren’t permitted in artists’ shanties, which makes his class all the more unique: sans computer, he used a chalkboard to lead a session on HTML, the markup language used to build web pages. A similar fusion of lo-fi and high-tech is demonstrated in the Letterpress Shanty. Using Twitter, Facebook, and a blog, shanty members are soliciting tweets, marked with the hashtag #shantyq, to typeset and print each weekend in The Shantiquarian, a newspaper that’s distributed on the lake. Fascinated by the current resurgence in the use of old printing techniques, artists Jeff Peterson and MC Hyland decided to bring metal typesetting to the lake. 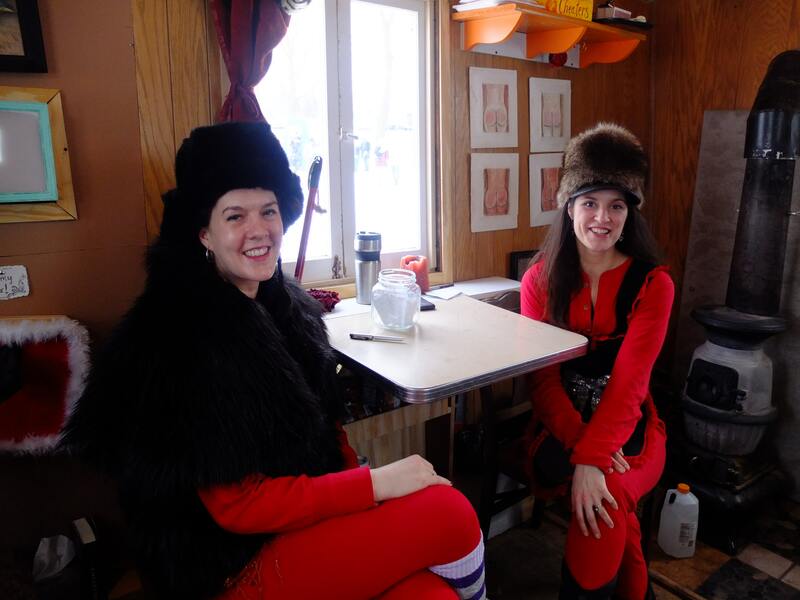 Garbed in red union suits, frilly aprons, and furs, artists Sarah Honeywell and Aneesa Adams say that they see the Art Shanty Projects as about “embracing this culture rather than longing for it to be different”–or, she adds, warmer. It also brings a healthy dose of fun. Visitors to the Naughty Shanty, which is modeled after a Romani (or “gypsy”) wagon called a vardo, are encouraged to steal cookies from a cookie jar, pull the finger of a mannequin hand emerging from a picture frame (you know the resulting sound effect), or deface a copy of the Mona Lisa (which already bears the “LHOOQ” graffito Marcel Duchamp used on a reproduction of the famed work). Another metaphor for the project might be a playground, as the Sit-and-Spin Shanty demonstrates. An egglike orb made of yellow- and green-stained wood slats, the shanty transforms the childhood toy it takes its name from into an enclosed pod in which visitors can get the shanty spinning like a merry-go-round by cranking a steering-wheel-like hub. Play here, as much as place, is the key. Both these elements—play and place—were there at the very start of the Art Shanty Projects in 2004. Thompson says that he and a few friends came up with the idea of making a “fort/studio/clubhouse” on the ice, but when he mentioned it at an artist’s talk, project co-founder David Pitman proposed that it be opened up to artists. What started as a lone shanty now includes 23. That first year, and for six of the ensuing years of the project, Pitman lived full-time in a shanty on the lake. While he’s not calling Medicine Lake home during the four-week run of the 2012 project, he’s still running the small pirate radio station he founded in a shanty that first year, K-ICE, in the Seward neighborhood of Minneapolis and online. An artist who’ll be pursuing a graduate degree in social work, Pitman likes how the Art Shanty Projects are expanding ideas about art by bringing in creators who may not define themselves as artists, moving the art experience from indoor institutions to unusual outdoor spaces, and reaching out to new audiences. And, perhaps the project is helping expand the definition of art itself. Notions such as “relational aesthetics” and “the commons” often used at art institutions these days are played out daily during shanty season. In engaging and highlighting creative people, the project is linked to Thompson’s other work, most notably his iconic A Project. Several years ago, he constructed a gigantic sculptural letter A that could travel on a trailer to art events and neighborhoods as a testament to the presence of artists. Greeting card–sized placards printed with the same red A still appear in the front windows of homes across the Twin Cities, indicating that artists live here.